The carnivorous plant is finding it difficult to thrive in its natural habitat. Thousands of little holes in the ground mean one thing to self-described protectors of North Carolina’s internationally renowned plant. Through years of excessive poaching, development destroying the plant’s natural habitat and fire suppression, the carnivorous plant is finding it difficult to thrive in its natural habitat, an area within 90 miles of Wilmington, scientists, environmentalists and law enforcement officials said. A plant that grew in 20 counties 50 years ago now grows in only 12, with 40 percent of remaining populations labeled as having a poor chance of survival, according to 2013 data from the State Natural Heritage Program. The recent theft of roughly 1,000 Flytraps in Alderman Park in Wilmington is likely a fraction of those poached each year, as officers and scientists say they routinely find Flytrap populations with thousands of plants ripped apart by poachers, on public and private lands. Working each year to catalog hundreds of species across the state, the State Natural Heritage Program records “element occurrences,” or EOs, of a specific plant. An EO is generally a cluster of multiple populations, or “sub-element occurrences,” of a plant in close proximity to one another, according to Laura Gadd, a botanist with the Natural Heritage Program. This year, there are only nine Flytrap EOs of “excellent viability” of the 67 recorded, according to program data. 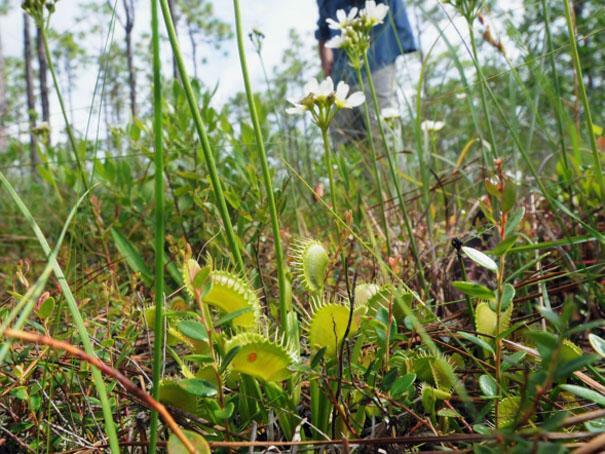 Historically, the Venus’ Flytrap’s highest populations were in Brunswick, New Hanover, Pender and Onslow Counties, according to Dan Ryan, Southeast Coastal Plain Program Director for the Nature Conservancy. Though the Flytrap’s habitat is theoretically a 90-mile radius around Wilmington, large swaths of that land are not inhabitable for the finicky Flytrap. Preferring soil high in acidity and low in nitrogen, the plant typically grows in soil that has been disturbed in some way. Flytraps thrive in long leaf pine savannahs that burn frequently, as they cannot compete with overgrowth that springs up without the flames, Ryan said. The Nature Conservancy conducts controlled burns on the Green Swamp Preserve in Brunswick County to encourage the Flytrap’s growth, burning about 2,000 acres of the 15,500 acre preserve last year, according to Angie Carl, a fire specialist with the Nature Conservancy. “At some point, you’re going to lose your large, viable populations (without burning). You may have a few stragglers here and there on roadside ditches, but (not the ones) that people come from all over the world to see,” Carl said. For Brandon Dean, his job sometimes feels like an exercise in futility. Tasked with enforcing wildlife regulations on thousands of acres of public lands in Brunswick County, Dean, a field officer with the state Wildlife Resources Commission stationed in District 4, is one of the few law enforcement officers who tries to stop widespread poaching of Venus’ Flytraps. Along with ginseng, the Flytrap is the most poached plant in the state, according to David Welch, director of the State Plant Conservation Program. The fine per offense is supposed to apply per plant poached, Welch said. In reality, poachers are never charged for each plant they take, Dean and Criscoe said, saying judges don’t try criminals based on how many plants they take. The state does not keep records specific to Flytrap poaching and does not keep records of reports of poaching, Kennedy said. 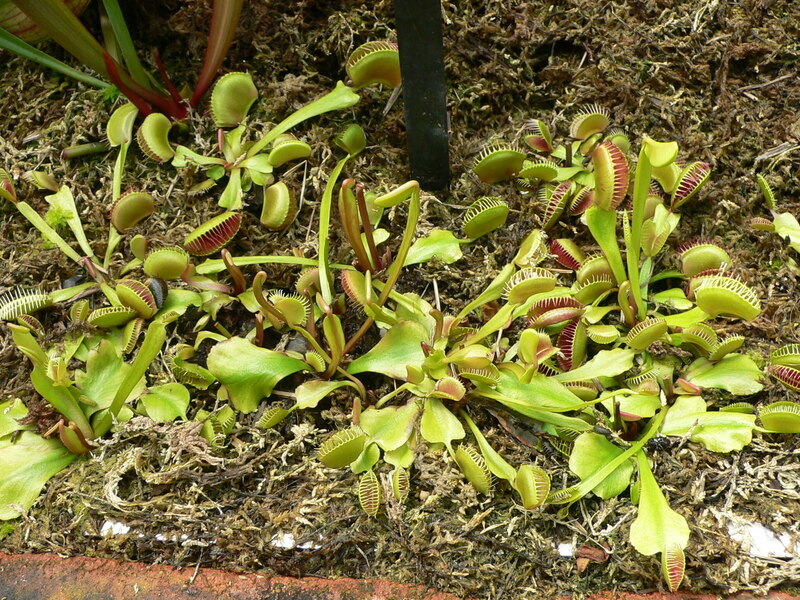 Testimonies from officers, scientists and others show, however, that thousands of Flytraps are poached nearly non-stop during the spring and summer. Nursery inspectors try to verify Flytraps are bought and sold legitimately, said Michelle McGinnis, Plant Protection Field Supervisor for the State Department of Agriculture and Consumer Services, but verifying a plant’s origin is difficult. “All (poachers) have to say is they dug these Flytraps on their own property,” Dean said. Through several doorways and classrooms, a team of researchers is fighting the Flytrap decline. Scientists at Southeastern Community College, led by Rebecca Westbrooks, are using micro-propagation to create thousands of cloned Flytraps to one day use to replenish poached habitats. “We have so much poaching going on, it would be a wonderful thing if we could put these back into nature,” Westbrooks said. By taking one plant, cutting it into several small pieces, feeding the plant a nutrient-rich mixture and chemically encouraging its root and shoot growth, researchers can turn one Flytrap into dozens in a short period of time. Not enough is known about how the DNA of the clones compares to natural Flytraps, making Westbrooks hesitant to place them in the wild, just yet. “It’s not fairly listed as threatened or endangered.” said Andy Wood, a coastal ecologist. “We’re moving them to get them out of harm’s way but their habitat is still lost.” Wood argues that the destruction of the Flytrap’s natural habitat through development is the plant’s biggest threat going forward.